Every organisation across the globe wishes to have a team that nurtures an environment of innovation, thereby helping it to thrive in the market and beat the competition. However, while earlier managing business processes and QA used to be on a per project basis, today, these have become a process of continuous planning, integration, and management. This has led to the development of an organizational model based on testing center of excellence (TCoE). 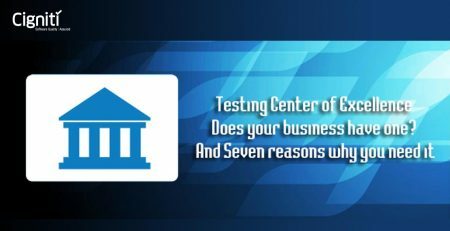 A TCoE is made up of testing processes, people, tools operating as a shared services function in order to provide testing services with optimal benefits across the test organization. TCoEs can accrue many benefits to an organization in terms of improved quality, lesser time to market and lower cost of ownership. This pretty much confirms the popularity of, and re-establishes the need for establishing a TCoE for organizations that want comprehensive and in-depth validation of their processes and systems. A well-integrated TCoE also helps reduce redundancies, supports risk mitigation, and also control IT-related expenses. So, how do we implement TCoE? Get an approval and agreement from all stake holders of the organization stating the need to establish a TCoE, and ensure that the multiple teams have clarity regarding the changes that will result due to implementation of TCoE. Analyze the current business processes, gauge the improvements that need to be made, and define clear processes and templates for the SDLC and STLC workflows that need to be implemented to bring about the required changes. Additionally, also reach a consensus regarding the intervals at which checks will be conducted to see if the processes are being followed. Identify what needs to be tested across the board quickly, and share observations and metrics that help add required value. Implement required best practices using well researched and scenario-specific tools that will speed up the process and help teams focus on other important activities. Keep working on the improvements so as to generate better ROI and establish an atmosphere of quality across the board. 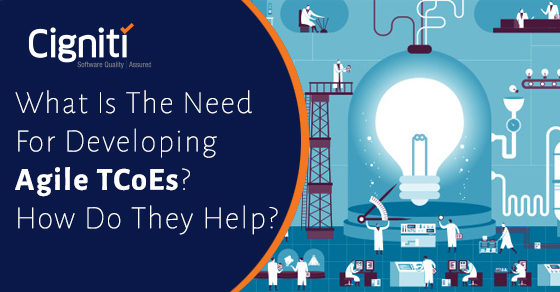 A TCoE, setup correctly, can help cross-functional teams collaborate together, reduce redundancies and streamline diverse testing processes, accelerating the software testing life cycle. A well-integrated, holistic TCoE approach helps testing organizations achieve the desired growth and excellence. A proper TCoE framework, while applying quality management principles, must take into consideration all the aspects of a test organization, be it processes, tools, services, or people. Some specific tasks that lead to a TCoE environment include conducting regular leadership meetings, allocating proper budgets, monitoring the effectiveness of processes, benchmarking performance of test organization for optimum ROIs, providing customized frameworks for enhancing productivity, and providing all types of testing functions spanning all business units. A thorough assessment of the client organizations testing process helps define and implement modifications that result in quality improvements and improved ROI. 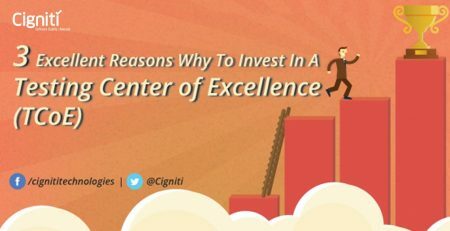 Cigniti’s TCoE framework consists of elements such as Executive Commitments, Quality Management, Drivers, a Jumpstart Kit, and a comprehensive package of Core Testing Services. These elements when integrated together help implement a full-fledged TCoE environment for your organization. Contact us today to discuss about implementing TCoE for your organization..